To reduce exposures to mercury, avoid or eat less largemouth and smallmouth bass, northern pike, pickerel, walleye and larger yellow perch (for example, longer than 10 inches) because these fish tend to have higher mercury levels, particularly in the Adirondack and Catskill regions. To reduce exposures to PCBs, dioxin, mirex, DDT, chlordane and dieldrin, avoid or eat less American eel, bluefish, carp, lake trout, salmon (chinook, coho), striped bass, weakfish, white and channel catfish, and white perch because these fish tend to have higher levels of these contaminants. PCBs, dioxin, mirex, DDT, chlordane and dieldrin are found at higher levels in the fat of fish. You can reduce the amount of these contaminants in a fish meal by properly trimming, skinning and cooking your catch. 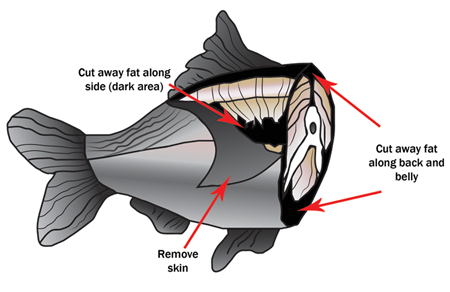 Remove the skin and trim all the fat from the belly flap, the line along the sides, and the fat along the back and under the skin (see diagram). Cooking or soaking fish cannot eliminate the contaminants, but heat from cooking melts some of the fat in fish and allows some of the contaminated fat to drip away. Broil, grill or bake the trimmed, skinned fish on a rack so that the fat drips away. Do not use drippings to prepare sauces or gravies. These precautions will not reduce the amount of mercury or other metals. Mercury is distributed throughout a fish's muscle tissue (the part you eat), rather than in the fat and skin. The only way to reduce mercury intake is to eat less contaminated fish. Choose freshwater sportfish from waterbodies for which there is no specific advice. Try to space out your fish meals. For example, if the advice is that you can eat up to four meals a month; don't eat them all in the same week. This is particularly important for women and young children. When deciding which sportfish to eat, choose smaller fish within a species since they may have lower contaminant levels. Older (larger) fish from the same species may be more contaminated than smaller fish because they have had more time to accumulate contaminants in their bodies. (But make sure to follow New York State Department of Environmental Conservation (NYS DEC) regulations about fish length). Do not eat the soft "green stuff" (mustard, tomalley, liver or hepato-pancreas) found in the body section of crab and lobster. This tissue can contain high levels of chemical contaminants, including PCBs, dioxin and heavy metals. For more information about how to reduce levels of chemicals in a crab meal, see the New York State Blue Crab Cooking and Eating Guide. Bacteria, viruses or parasites may be in or on fish. Keep harvested fish cold. Wear protective gloves when skinning and trimming. Wash hands and surfaces often when preparing fish, and keep raw foods separate. Cook fish and shellfish thoroughly before eating. Anglers who want to enjoy the fun of fishing but who wish to eliminate the potential risks associated with eating contaminated sportfish may want to consider "catch and release" fishing. Refer to the NYS DEC's Fishing Regulations Guide for suggestions on catch and release fishing techniques.